The following guest post was written by Tom Standing, a member of ASPO-USA and a "semi-retired, part-time civil engineer for the City of San Francisco." Here Tom takes on the calculations for a 280 MW solar thermal plant in Arizona that I looked at back in February. My conclusion from that essay was that the electrical capacity of the U.S. could in theory be met on 10,000 square miles of land (with the normal caveats about storage, costs, etc.) Tom peels the onion a few more layers and puts the energy production into perspective. You and I met at the Sacramento Peak Oil conference. Your presentations and discussions were most enlightening. I was heartened by your analysis of cellulosic ethanol. I have always been deeply skeptical of the notion that the U.S. might displace a meaningful portion of transportation fuel with biofuels from cellulose. I could give you some of my thoughts on this subject, but you have already covered the territory thoroughly. I want to comment on your calculations you posted in TOD in February, regarding the proposed 280 MW solar thermal plant in Arizona. First, a bit about my background. I started my career as a chemical engineer, first in refinery operations, and then chemical processing design. But that was only about 4 years. Most of my career has been as a registered civil engineer in a variety of disciplines for the City and County of San Francisco. Over the years, I have become interested in, maybe even fascinated by, the prospect of utility-scale generation of electricity from qualified renewable sources. Throughout North America and Europe, many people have focused on renewable energy as a means of reducing dependence on Middle East oil and reducing CO2 emissions. They see renewable energy as an important element to achieve emissions targets of the Kyoto Protocol. In the U.S., renewable energy from wind, solar, and biofuels appears to be a keystone for energy policy in the Obama Administration. In Texas, T. Boone Pickens is campaigning for a new American energy policy centered on major input from wind-generated energy to displace electricity generated from gas-fired power plants. Natural gas would then be redirected as CNG to power autos and trucks. In California, Governor Schwarzenegger sees his “Million Solar Roofs” program as leading other states to do likewise, thereby reducing CO2 emissions. California utilities are mandated to supply 20% of electricity from qualified renewable sources (wind, solar, bio/waste, geothermal, and small hydro) by 2015. Contributions from these sources have been stuck in the range of 10-11% since 2000. The 20% mandate appears to be a major challenge, maybe unrealistic. Many questions come to mind in looking at the proposed Arizona plant. What precisely does the 280 MW refer to? Is it the plant’s output at capacity? Is it an annual average output? How much electricity will it generate annually? How will output vary during the day, or by season? How will output be affected by clouds? There is important data available and a few fundamental design features that will answer these questions. Costs for construction, however, are not my strong suit. Other analysts will have much better information on costs. Cost of the plant will not change the results of my analysis. Reliable data for site-specific solar radiation (insolation) is critical to estimating solar capabilities. Fortunately, a massive database for insolation is posted on the National Renewable Energy Laboratory (NREL) website. In 2000, an engineer who designed solar facilities directed me to the site; I was utterly amazed at what was there. I had to be extremely selective to get the most useful data. I settled on 30-year (1961-1990) average insolation for 239 U.S. cities: monthly and annual average insolation in kWh per square meter per day. Readings for all 239 stations are given for all possible orientations of solar collectors, either fixed or tracking systems. Amazingly, insolation data is also tabulated for averages of each hour during the 30 years for all 239 stations (kW/m2), enough data to make your head spin! Data is also tabulated for insolation of all collector orientations at 239 locations above Earth’s atmosphere! For reference, I eventually copied pages that filled a binder weighing 10 lbs. A rough approximation for coverage of the 1,900-acre site with solar collectors is 50%. Space is needed for maintenance and control centers, electrical converter units, towers for power lines, and maybe a backup power facility fired by gas or oil. Proposed facilities to store electricity for release at night will also consume land. In 2001, I toured a solar thermal plant at Kramer Junction in California’s Mojave Desert. At one square mile, it is about 1/3 the size of the Arizona plant. I would say that close to half of the site is taken up by gravel roads for maintenance vehicles. At least weekly, wash trucks at night clean the collectors of dust that frequently blows around. The roads also provide necessary space between rows of collectors to prevent shading. Collectors tilted upward to gather more sunlight cast shadows at low sun angles. If the designers in Arizona are really stingy with land use, they may be able to cover 50% of the site with collectors, including facilities for power storage. As with Kramer Junction, the entire site will be dedicated to industrial use, fenced off and completely secure. Areas covered by collectors are denuded of vegetation, graded, and compacted. There is hardly space for a rodent or a bird to live. Collectors are supported by steel columns embedded in reinforced concrete foundations designed to resist maximum wind forces upon the considerable surfaces of the collectors. These are real-world features that solar advocates overlook when they envision hundreds of square miles devoted to solar power. We calculate the area of solar collectors in square meters to utilize NREL insolation data. The 1,900 acres converts to 7.7 million sq m. With 50% for collectors, 3.8 million sq m are on the site. The Arizona plant is to be a concentrating system that tracks the sun. Surprisingly, NREL data shows that concentrating systems collect less sunlight per sq m than systems consisting of flat plates, one-axis tracking, tilted at an angle = to latitude of site. Thus to be generous, I will calculate the output based on flat plates, 1-axis tracking, tilt = latitude. For Phoenix, NREL data gives average annual insolation for our model as 8.6 kWh per sq m per day (i.e. all days averaged for 30 years). For Tucson, insolation under our model is 8.7, with slight differences for each month. The solar thermal plant at Kramer Junction converts about 15% of insolation striking the collectors into electricity. Therefore, a decent assumption for the Arizona plant that would be consistent with our other assumptions is 15% conversion. This power output is, of course, highly variable, depending on time of day, season, and cloud cover. To get an idea for seasonal changes, the NREL data tells us that plant output would average 257 MW for an average day in June, to 138 MW for an average day in December. What might be the maximum electrical power output of the plant? It would correspond to maximum insolation, which is roughly 1,000 watts/m2. Fifteen percent conversion gives a plant output of 150 W/m2, times 3.8 million m2, so maximum electricity generation = 570 MW. According to NREL data for the desert, maximum insolation duration is about two hours a day under cloudless skies from late spring through early summer. The duration of maximum shortens with increasing time away from June 21. In early spring and late summer, maximum insolation slips below 1,000 W/m2. Clouds have a widely variable effect, from a 10 or 15% reduction from thin cirrus clouds, to a 50-70% reduction from dense cumulus clouds (thunderheads). At Kramer Junction, operators adjust flows of the heat transfer fluid whenever a cloud drifts over the array. I seem to remember that operators engage small electric pumps to keep the fluid flowing in portions of the array that experience cooling. The Arizona array, with three times more area, will experience more frequent effects of cloud shadows. Thus the 1,900-acre Arizona plant will generate roughly 1.8 billion kWh per year. Let’s give this quantity some perspective. EIA statistics for renewable energy in 2007 show that wind-generated energy in Texas was 8.1 billion kWh. Thus it would take four and one-half plants the size of the Arizona plant to match Texas wind energy for 2007. A more telling comparison is with the recent growth of electrical consumption in the U.S. EIA statistics show that the U.S. consumed 2,885 billion kWh of electricity in 1992; in 2002 consumption was 3,660 kWh. Average growth, then, was 77 billion kWh per year over the 10 years. Thus the electrical energy that would be generated by the Arizona plant would supply only 2.3% (1.8/77) of one year’s growth of U.S. electrical consumption. I do not have electrical consumption broken down by state, but I would guess that Arizona could build a solar plant of equal size every year, and they would barely cover their own growth in electrical consumption. I have not touched on PV, but there is much to discuss. NREL data is so extensive that there is almost no limit to analyses that could be done. For now, I should only refer you to an article that I published in the Oil and Gas Journal, June 25, 2001 issue. I graphically displayed annual insolation curves for a wide range of locations. At a glance the reader can see how insolation varies with latitude, longitude, and collector orientations. I also ran through sample calculations to see how much energy can be generated. An important finding is that insolation for most of the eastern half of the U.S. stays within a narrow range: 4.6 to 5.2 kWh/ (m2-day), with fixed collectors facing south, tilted at latitude for maximal exposure. The above calculations are purely rational, using insolation data and general assumptions in design. Actual practice shows that solar installations typically generate 10 to 15% less energy than what the calculations show. Thanks for shedding some more light on US CSP options Robert and Tom. To add to this, here is some information on the thermal storage aspect of CSP http://www.spectrum.ieee.org/oct08/6851 which is a differentiating factor over wind. I like to compare projects to a single 1100 MW nuclear plant operating at 90% capacity factor which produces about 8.6 billion kwh per year. So it would take nearly 5 CSP plants of the size you mentioned to equate one typical nuclear plant. So to take this one step further, how many square miles would be required to produce the same amount of electricity as the US consumes, with temporal and transmission considerations aside for the moment? If 1900 acres can produce 1.8 TWh per year, and the US consumes 29,000 TWh billion kWh per year (2005), we would need 1900 times 29000/1.8 divided by 640 acres/sq mile = 47,830 square miles, which is less than half the size of Arizona. Consolidation of maintenance and other buildings (some might even go underground) could reduce the footprint needed. An exercise to see how much of this could be generated by putting high efficiency PV on every rooftop (and over every roadway and parking lot) would make this more distributed, and utilize space that is currently wasted. A combination of the two approaches would provide us more electricity than we would need. While a shift to electrified transport would conversely act to increase the above consumption number, measures to reduce energy consumption through energy efficiency building practices (such as a 90% reduction in building energy using Passivhaus techniques) would reduce this number considerably. Where did you get your US electrical data? The BP spreadsheet shows 2005 US electricity generation at 4,257 TWh per year. Using this number, I come up with 6,949 square miles (7,130 square miles using 2007 data of 4,368 TWh). Yes, my first comment above was before my first cup of tea this morning and reflects the TOTAL energy consumption of the US, not just electricity. I'll refrain from posting before morning tea in the future :-) , though it doesn't hurt show what a complete replacement of US energy by solar might be as a brainstorming exercise. I found 4,064,702 GWh/yr of 2006 US electricity at http://www.eia.doe.gov/cneaf/electricity/epa/epates.html , so definitely replace my previous number. Your 7130 square miles sounds accurate, and it's only about 1/15th of the size of Arizona (114006 square miles). Other comments below about reducing energy consumption are absolutely valid, and I consider these to be steps everyone should be taking, (myself included). You have to be very careful about those total energy consumption numbers, because large fractions of raw energy inputs represent heat lost in conversion to electricity or fail to reflect efficiencies which would become standard if the input was electric (e.g. heat pumps for both space heat and DHW). That's about 18,000 TWh. Which means, that we would need to build 782 TWh per year, for 23 years. This essentially means, we would have to build one solar plant, 18% larger than the one described, every DAY for the next 23 years. Time to get out the shovels. When looked at as a percentage of total land area of the USA the amount of area is 1/8th of one percent. Subtracting Alaska and figuring in the low insolation factors of some regions then around 1/2 of a percent of any region's surface area could provide all of our energy needs. That is 3.2 acres per sq mile leaving 636.8 acres for other uses. The conversion factor used by the IEA for electricity is: 1 TWh = 0.086 Mtoe. So, 129,062 / 2.2 = 58,665 km², or a square area 245 km on a side. or 100 areas 24.5 km on a side. So, 129,062 / 2.2 x 2 = 58,665 km² x 2 = 120,000 km², or a square area 347 km on a side. or 200 areas 24.5 km on a side. So, 129,062 / 2.2 x 2 X .25 = 30,000 km², or a square area 180 km (110 miles) on a side. or 100 areas 17.5 km (10 miles) on a side. So, 129,062 / .132 = 955,000 km², or a square area 1000 km on a side. or 100 areas 100 km on a side. So, 129,062 / .132 x .25 = 250,000 km², or a square area 500 km (310 miles) on a side. or 100 areas 50 km (31 miles) on a side. Usage efficiency needs to be addressed in any discussion of PV generation. Besides distributed generation, any such efficiency savings are by nature distributed. For example, before you go build PV to power lighting, EVERY incandescent bulb should go away. Energy pricing alone will drive such changes naturally, and just a little bit of incentives to help the step-in cost (say, rebates or tax credits) would help a lot. These are truly trival changes (no new wiring, no specialized contractors, just Joe Sixpack swapping out bulbs). Added insulation, storm windows and doors, minor repairs - all things we should do now and MUST do as energy expenses rise. Higher efficiency appliances and HVAC are harder, as the cost magnitude is higher and usable life is longer, but regulations need to ramp up quickly too. Running a 21-SEER GSHP for A/C takes much less power than a 10-SEER A/C unit, and hopefully one just half the size due to efficiency gains above, will save a lot too. In many ways, industrial and commercial efficiency gains are easier than residential (fewer locations, better scale points, savvy financial staffs). HereInHalifax proves that with his work posts at least once a month! I agree with your direction, Paleocon. However, a major problem with achieving efficiencies in industrial and commercial buildings arises from the fact that commonly the name on the utility bill is not the building's owner. What is the incentive for a tenant to increase the building's energy efficiency, when he/she may be not be around to realize the benefit? Has this problem been tackled anywhere? Even for residential buildings, the owner isn't necessarily the renter. I rented an apartment here in Tucson with electric water heating, electric everything. The electric bill was my responsibility. I figured the apartment complex could save their tenants a lot of money by installing solar hot water heaters, but then they have to advertise a higher rent number. My solution is smarter renters who look at the total cost, rent+utilities. Smarter renters can't do squat if landlords don't try selling efficiency. A more direct system would be to require landlords to include X BTU of space heat and DHW in the rent, and let them figure out if renewables are economical. Yeah. But smarter landlords can't do squat if nobody will pay the extra rent. If there's a demand for energy efficient units, I expect the market to meet it. Landlords can try advertising the efficiency of their units but I don't know if that would succeed. Space heat isn't an issue in Tucson. There's already a nationwide law requiring all new air conditioners to be at least SEER 13. Israel requires all units to have solar hot water heaters but it's a small country that's all desert. Arizona could pass a law like that but I don't know how well solar hot water works in Idaho or New York. Everybody would be paying the extra rent (and less in the utility bills), so all the landlords would start out equal; it's just a question of how much it costs the landlord to deliver the X BTU/month, and thus how much of the rent they get to keep. I expect wide regional variations in such laws; what matters is that they apply to all equivalent units in a market. You're going to require landlords to spend a bunch of money and raise rents? What about the people who complain about the lack of affordable housing? It makes zero sense to hold landlords to a different standard than homeowners. Just upping the efficiency of new units and new construction is about the best you can do, unless you're willing to foot the bill. Heck, even the SEER 13 law shifted the repair/replace value point considerably, and grey-market coils are still avialable for repair applications. Unless you provide funding, such changes will take 20 years to roll into full effect. Much higher energy prices makes it all happen automatically. It's just a painful mechanism. "You're going to require landlords to spend a bunch of money and raise rents? What about the people who complain about the lack of affordable housing?" Does it really raise rates, if the greater efficiency pays for itself? Don't most of these pay for themselves, if you amortize the cost over the life of the improvement? You can't amortize the expense very long without lending assistance. You can't as readily get second mortgages and low-cost money for investment property improvements, so 20-year paybacks would be impossible. It'll take some sort of gov't structured program to make it work very well, or only cash-flush small-time landlords will be likely to consider such improvements. And no, the efficiency will not pay for itself, as the lower rents will always win regardless of efficiency. Some places premium rents go for location, but most people cannot see past the $/month for rent for potential savings on energy. They will instead convince themselves that they could use less in the cheaper place and that the numbers for the efficient place aren't "real" for their situation. Only if the customers are well informed and rational. The penetration of CFL here in Northern California, where many are paying $.35 KWhr (marginal rates for people who use a lot), is still pretty low (under 50%). Just having cost effective solutions available, doesn't mean they will be widely utilized. Then think of the typical industrial situation. Costs are compartmentalized. One department is responsible for capital expenditures, another for operating costs. If the manager of the former buys a premium priced unit which will pay for itself by cutting the operational budget, he may still have to answer to the COO for exceeding his capital budget! There is a lot of inertia, both institutional, and psychological. This means that the actually deployed systems are far behind current (economics tuned) optimal solutions. They're already paying for the energy costs (or doing completely bone-headed things like using and refueling kerosene heaters indoors, with occasionally fatal results). This would be a cost shift, not a cost increase. This is indeed a difficult problem. The obvious solution is for both to share the savings -- the building owner assists with improvements and gets more in rent, for example -- but that requires a level or trust or some sort of certification to "prove" the stated savings. Tight credit makes this much more difficult, hence my thoughts that incentives would help reduce step-in costs. I face this same conundrum in my rental units (a small side-line business). If I choose to install high-eff heat-pumps, high-eff hot water heaters, new insulated siding, CFLs, lots of attic insulation, and storm windows I will incur very significant costs, yet if I raise rents I will lose tenants to lower-rent/higher-utility landlords. It requires either an increased level of savvy on the part of tenants coupled with access to low-cost capital for improvements, or a flood of new efficiency regs that requires upgrading of equipment and houses (which would likely become unfunded mandates, and drive a lot of small-time landlords just to sell the properties and exit the business). The best I have done so far is to choose higher-eff solutions when normal maintenance is required, and do upgrades between renters and raise the rent a bit. I have learned that you should never do upgrades while a unit is occupied, and you can rarely raise rents without swapping tenants. So far all upgrades have actually required sacrifice on my part, and I'm wrestling with a bunch more such projects right now, and I'm deferring some needed maintenance on rentals while I invest in my primary residence. As for incentives, the few that do exist never seem to apply to individual small-time operators like me. I have thought about going to a "utilities paid" arrangement, but that just invites wasteful usage on the part of the tenant. In short, I'd love to hear of a workable solution for this issue, too.
" if I raise rents I will lose tenants to lower-rent/higher-utility landlords....I'd love to hear of a workable solution for this issue, too." How about a regulation that requires all landlords to advertise their rents with a notice of the average monthly utility cost for the last year, and a prominent total figure for the two? Like MPG stickers for cars? Then, you could show that total living cost hadn't changed. I'm working up on post on it with one of the experts in the field. The problem that Paleocon is bumping into is known by economists as the "split incentives" problem: the landlord bears the cost but the tenant reaps the benefits. And the key to breaking that dead-lock is exactly what aangel mentioned. which analyzes the problem in detail and describes a very elegant solution (of the win-win variety). I won't even try to do justice to the proposal in a couple of sentences, but I recommend this paper VERY highly. If only I knew how to get a copy of it onto the desk of whoever is designing the renewables/efficiency part of Obama's stimulus program! The same approach should also be applicable to funding solar energy systems. I met recently with my state representative (who just became the chair of the Assembly Natural Resources Committee, now that the Dems have retaken the Assembly) and gave him Joel's paper. I told him that putting seed money into a revolving, self-liquidating loan program seems to me to make a lot more sense than expecting the tax-payers and rate-payers to keep doling out grants and rebates ad infinitum. Handouts don't scale; revolving loans do! Thank-you and everyone else. I have a meeting coming up with my representative in the provincial legislature. I'm going to summarize this material and see if I can convince him to take recommendations forward. Getting a good feed-in-tariff program in place to encourage the development of distributed renewables would help too. Here is a good policy brief on this subject http://www.newrules.org/de/feed-in-tariffs.pdf We are working on some similar legislation in Michigan with the help of Paul Gipe who spoke at the 2008 ASPO conference. I am a bit leary of the potential for OTEC given the mass flows of water required. Looked at an OTEC facility 30 years ago for the Virgin Islands Water and Power Authority (VIWAPA)and the cost was about $135 million for a 10 MW plant. Huge piping and pumps required to move all of that water up from a 4000 ft depth and a very high parasitic load too. Our state is also beginning to look at some wind energy projects in the great lakes so that will be interesting to see how it plays out. We also need to be looking at options for HVDC transmission lines as needed infrastructure improvements to get large blocks of solar power quickly from the southwest to the rest of the power grid in the midwest and east. Jim, I'm over by Lake St. Clair. Can you touch base with me on your Michigan efforts? Mail is my user name minus the hyphen and a suffix of 38215 at the old yahoo. Jim--OTEC has long been discredited for reasons you state above. A more easily accessible (via the AVE) alternative cold sink is the tropopause, which is also much colder than deep ocean currents. There should be at least 2-3 times the working temperature difference as compared to OTEC. The energy "source" would be the seasonably warm surface waters of any of the Great Lakes (July-Jan), while the residual CAPE in the atmosphere above Michigan should provide a fair amount for the February-June period. During exceptional cold snaps, the AVE could possibly benefit from supplementary Natural Gas firing. Michigan and Florida are two states with "residual solar storage" resources ideal for maximizing power output of the Atmospheric Vortex Engine (protestations from E-P notwithstanding). I encourage you to contact Mr. Michaud at AVEtec to consider this for your future projects. Also for references contact Prof. Nilton Renno at U.Mich., or the Wayne State University. Mr. Michaud gave a presentation there a year ago which was well received and which you can download from the site given below. Given the distribution of upper-level winds over N. America, gyromills are probably a better bet for Michigan than any kind of vortex engine. The "fuel" is already there, and capacity factor for the area is estimated at ~80%. 200 megawatts at $15 per watt installed is about $3 billion. The payback for solar, in real economic terms is over 75 years. The lifespan of solar cells is in the range of 25-30 years. Why invest in a technology that can't generate positive returns? Doesn't that all depend on the price of electricity? $15 per watt seems awfully high for installed price when the cost at the panel level is just $4 per watt today, and prices are trending down. ROI does indeed depend on the price of electricity, which in the US is largely driven by the price of fossil fuels. Oil at $40 is not going to last, for all the reasons listed on this site, which I why I figured that the payback was around 75 years. If you use current electrical power costs the pack period is over 100 years. Cost per watt installed includes not only the panels but the wiring costs, the physical support structure, and the costs of inverting/transforming the electrical power into AC. Panel costs per watt at the retail level are running around $5; I was figuring about $3 per watt for panels only for a really big install, but that is a SWAG. Steel, concrete, and copper wiring costs are all driven by energy costs so $15 per watt is a reasonable first order approximation. Could be as low as $10 with really good design or maybe as high as $20. Then there is the issue of the value of the dollar, which I'm not going to address, but simply note. While the specifics you noted could be debated (or adjusted with real numbers), I also want to add that external costs have not be included in the payback period above, nor have EROEI considerations. A large installation might benefit from economies of scale, but it seems the best bang for the buck is to piggyback on existing infrastructure. Put 3-100 kW on residential and commercial rooftops. Make it obvious by putting systems on schools and post offices. Every flat roofed strip mall could be used with no additional footprint. My own 3 kW system cost just over $20,000 6 years ago (rebates cut this in half). The cost to make a panel has gone down (although it doesn't seem that the price has!). With no rebates, this is $7/watt for panels, labor, inverters and wiring. Note that there is minimal transmission loss with this distributed power, and that this power is produced during what is usually peak demand. (BTW...my system averages 4230 kWhr/year, with less than optimal configuration dictated by the city). I agree with posters who note that efficiency should take precedence over new generation, and I still need to do plenty of that. My decision to install solar was as a break even investment that supports and industry that I believe in. One can look at the installation cost and generation and come up with a 10-20 year payback, although I like to point out that my energy production is about $100/month, and my financing cost is $50/month (in fairness it would be twice that without the rebate--break even). Bottom line....lots of small systems is better than a few big ones because of losses and infrastructure needs. I also think that properly designed systems in the right setting should be much less than $10/watt. Mine was $7, and the technology should be bringing that below $5. 4230 kwh/year /12 months/year = 352 kwh/month. $100/month / 352 kwh/month = $.28/kwh. Where do you live that grid electricity costs $.28/kwh?!? I pay $0.08. Scarey, isn't it? I'm in SoCal, with an all electric house. There are some Time of Use tricks to make the rates adantageous, but even with regular metering it ads up. "Delivery" is 7 cents, 25% of my power comes from DWR at 9 cents, and Edison gets the rest at 3, 6, 15, 20 and 25 cents as we move up the tier structure. My marginal power is 4th or 5th tier, which gets me to the numbers above. A few short years ago I was single, lived in a house with natural gas, and wouldn't have been able to use enough electricity to bother with solar. Now I can't believe how much we use. I've chipped away at efficiency stuff, but the house is from 1947 and needs a little help with just about everything. Here in Jamaica, my most recent electricity bill has the first 100kWh costing me about $0.21 and the rest $0.275. The local utility uses largely steam plants, fueled by bunker c fuel oil, all of which are more than thirty years old. The newer plants are a couple of slow speed diesels and some gas turbines, the newest of which are combined cycle units so, all in all a very oil/gas dependent picture. I linked to a couple of PDFs on the subject of Jamaica's energy consumption in this post in the November 14th Drumbeat. I am hedging against FF powered electricity by installing PV of my own. Last year we saw what might be the future of oil prices and I doubt there are many on this blog that would think I'm wasting my money. If oil prices go up significantly and PV panel prices do not come down in short order, I figure I'll be well ahead of the game (providing we avoid a catastrophic collapse). Somewhere downthread someone characterized solar PV as a gigantic fail. At $30 a barrel oil I'd agree but, at >$150 I'm not so sure. If you are installing a photovoltaic system on an already existing house, there is no steel and concrete cost. The copper wiring is maybe a dime a watt. For a 3kW system, that gives you a $300 budget for wiring. You only need maybe a hundred feet of 8 gauge wire. The aluminum racks cost something, maybe another dime. The inverter is about 60 cents a watt and it needs to be replaced every 10-15 years. I put in a 3.7kW system for $37K, of which the government covered a third of the cost. I figure $10 a watt, $5 for parts (total) and $5 for labor, and that's a high end number. You can get that number down substantially by doing the work yourself and/or buying second hand panels on Ebay. 15 $ per watt is way off. http://www.solarbuzz.com/ - of course there are other costs to a complete installation but it will not go anywhere near 15$. But the rapidly increasing efficency at all the parts of the industrial value chain of photovoltaics is leading towards production costs way below 2 $/watt around 2010-2011. So if there was to be a supply glut at that period the most modern solar PV-factories could sell panels with good profit at 3 $/watt. If demand is still high they can expect to make a huge profit. I have in front of me the cost estimate for a small (1MW) PV plant installed in Spain last September, and it works out at 8.5€/W or about 12$/W. And that was in the midst of an artificially induced -via tariff changes- PV solar investment boom -with consequent price hikes in many inputs. I reckon that the USA can do better than Spain in terms of increasing PV industrial efficiency. The 15$ figure seems too high. There is hardly space for a rodent or a bird to live. Let's cover half of Arizona with solar thermal collectors. Good idea! All you technocopian engineering types have entirely too much time on your hands. See above where the calculations have been corrected to show the area required is only 1/15th of the state of Arizona. And again, solar is but one arrow in the quiver of renewable sources (wind, geothermal, hydro, wave, etc). Subtract out the current 7% hydro, a notional 40% wind, 10% geothermal, 10% wave/tidal/OTEC, and that leaves only 27% needed by solar, which would mean 1/60th of the area of Arizona, not even factoring in rooftop installations of PV. Will, I hope that the costs per watt for these other technologies are much lower than solar, or we are going to keep burning fossil fuels. That depends upon the fiscal penalties placed on fossil fuel systems by future incremental cap-n-trade and/or carbon taxes. Which is why rooftops, parking lots and other developed areas should be priority locations for solar projects rather than first looking at huge, centralized plants plunked down in the middle of a delicate habitat. I do wonder whether some more remote installations could be a bit more eco-friendly. Does anyone know of a major solar development that worked to leave as much native habitat in place as possible? I think we have to come around to the fact that the market is not going to be a very good mechanism unless it is managed much more heavily and in the direction needed. This of course brings up many difficult ideological and pragmatic problems, but I think we have to get past the idea that the market is going to give the right signals--or strong enough signals in the right direction--for a powerdown. The market seems to be efficient at maximizing resource exploitation rather than at effectively husbanding diminishing resources. The *free* market is an excellent mechanism for delivering what people want. It would be nice if we had one. A FREE market, I mean. Doesn't exist. What we have is a kludge of regulation caused by efforts to 'regulate' the desires of the people who trade in the not-so-free markets we have. 'Managing in the direction needed' isn't going to work. Never has worked, won't work today, and never will work tomorrow. Good engineering takes reality into account, whether it's social engineering or power plant engineering. Wishing will not make it so. Forcing people to spend excess real wealth to get the power that they want will reduce productivity. Period. Read "economics in one lesson" by Hazlitt. If you want to promote solar power use, invent a more efficient or less expensive solar power cell. Absent that, photovoltaics will not work to provide a replacement for fossil fuels. Right now, photovoltaic power makes sense only for those cases where provision of central grid power is extremely expensive, or where costs are not a factor. My solar power install cost about $10,000 for a 1.6 KW setup, excluding batteries. I did not get it to be green or to save money, I got it because I wanted a silent power source just in case, and was willing to spend the dollars for that capability. Does it make economic sense? Hell no! "A FREE market, I mean. Doesn't exist." Right because they cannot exist and never have. An unregulated market is a hold up. But those calling from free markets pretend that they are possible, but they really mean "a market that makes it easiest for me to make the most amount of money in the shortest time." I don't have to read your economics text to know what it says. As Herman Daly (and others) put it--economics (that is standard noe-classical economics) is an ideology parading as a science. Most topics about economics degenerate into ideology. Free markets are only a resource utilization optimization strategy, and they do often work if certain conditions hold. They aren't without pitfalls. Free markets can lead to improved economic development; Under the wrong structure they can do the opposite. Nicely put, except again, a 'free market' is a contradiction in terms. If it is not regulated, it's not a market, it's a hold up. As long as people use the term 'free market,' they can continue the fantasy that market places can be completely unregulated. But unregulated means n o r u l e s. No rules means I can kill you and take what you have. That is not what most think of as a market. How much and what kind of regulations are make for optimal markets in various conditions--these are valid discussions. But the second anyone uses the term "free market," rational discussion has ceased and non-sense and fantasy have broken through. My solar power install cost about $10,000 for a 1.6 KW setup, excluding batteries. I did not get it to be green or to save money, I got it because I wanted a silent power source just in case, and was willing to spend the dollars for that capability. Does it make economic sense? Hell no! If wanting and being able to afford a silent power source just in case, doesn't make economic sense, then why does anybody pay for any kind of insurance. Just in case my house is flooded or burn't down or I get sick and need medical attention or my car is wrecked in an accident and I need to replace it means that I must pay for the Insurance. So yes, it absolutely does make economic sense as a hedge against the "just in case scenario". Of course if I can't afford it then the point is moot. However $10,000 spread out over the average 20 year life of your typical PV installation doesn't sound like very expensive insurance to me. Granted I am quite aware that this isn't currently an economically viable option for the average citizen. Maybe we need a government that will provide us with an affordable decentralized universal energy plan similar to our universal health plan... oh wait! I live in Florida and I just remembered hurricane Wilma when we didn't even have solar powered traffic lights... not to mention Katrina. /snark off. I particularly liked your ground-level description of the Kramer Junction plant. There was a newspaper article (NY Times IIRC) a few weeks ago showing people scraping snow off their solar collectors in the northern US. Cleaning roof mounted panels after a major snow/ice storm must be a real pain. Cool Earth has created a "solar balloon" that is transparent on one side and silvered on the other. It looks like a giant beach ball and works by concentrating sunlight onto a photovoltaic cell at the focal point. It will be interesting to see how this (or similar designs) stand up in severe weather. At a guess, it would probably resist snow and ice buildup quite well because of the shape and flexible surface. Cleaning roof mounted panels after a major snow/ice storm must be a real pain. I can't speak for others, but I use a long handled window squeege with an extension, the kind people use to wash their second story windows. One doesn't have to do a very thorough job, as the sun comes out and quickly warms up the panels, melting any leftover snow. I've kept a Catwalk set up just below the peak, so I have pretty easy access.. I do still need to create a little tool rack up there. (probably right underneath the panels themselves) I love being on the roof, but I know few others who share the fondness, even my rockclimbing wife. One other approach might be to get a Hose-spigot placed up there (or on the ground, I suppose), and run Hot or Warm water to it, just to de-ice the panels.. or have some de-icing circuits, heat tape for pipes, old electric blanket(s) mounted against the underside of the panels so you can do a defrost blast to them after the nor-easters..
We just had actual snow in Tucson. No accumulation below 3000 feet meaning except for in the mountains. I use a hose with a nozzle for cleaning off sand and dust. It might be preferable to use the term 'alternative' rather than 'renewable' with reference to these kinds of energy production facilities (energy capital). The reason is that unless these capital plants are producing enough excess energy above their supply to the consumption markets to maintain and reproduce themselves, they are not long-term sustainable. Any plans for construction of truly sustainable alternative (to fossil fuels) energy capital (centralized or distributed) must include capacity and some kind of storage that will enable the replenishment to come from within the alternative energy production itself. Currently all alternative capital is built using fossil fuels (or hydroelectric, but dams are not particularly long-term sustainable either). Complete independence from FF subsidization should be a technical requirement for all alternative capital production. It also must be capable of sustaining infrastructure such as transport and transmission capacities. A very amateur job. Read a real engineering report. See esp. pp 18 in 2nd ref. "Figure 2: Areas of the size as indicated by the red squares would be suffi cient for Solar Thermal Power Plants to generate as much electricity as is currently consumed by the World (17,000 TWh/y), by Europe (EU-25, 3,200 TWh/y) and by MENA (600 TWh/y) respectively." -- The relevant area shown on the map for "All Earth" is a postage-stamp-size square with dimensions about comparable to the island of Sicily. I only saw one mention of storage in this analysis. The biggest problem with solar power is that it doesn't work when the sun is down or with heavy cloud cover. Solar may provide peaking plants during hot periods of high air conditioning use but it is not ready to replace coal, nuclear, or natural gas in electricity generation. My other reaction was in regards to the Environmental Impact statements and permitting process for essentially paving a substantial percentage of the state of Arizona. The lawsuits from environmentalists will probably delay any construction for many years. One man's desert waste is another's fragile desert ecosystem. See Sargent & Lundy's engineering report I referenced above. Cheap insulated tanks of sand and gravel acting as thermal storage medium, collector to turbine ratio of 3:1 provides 83% capacity factor, 4:1 exceeds 100%. Obviously 3:1 with emergency natural gas burners for unusual unavailability periods, widest dispersion possible. Requires a plan and a commitment to serious installation volumes to work. I did not have time to evaluate this report in detail but the section which discussed storage pointed out that their storage system had not been demonstrated commercially at the temperature they were postulating. I am familiar with a system using stone and another using ceramics as the heat storage medium. I am resonably certain that such a system could be built for thermal storage in a solar power plant. However my experience inclines me to be sceptical of the adjective "cheap" for this sort of high temperature system. Theoretically one could use batteries or capacitors to store electicity. The quantities of electricty involved produce engineering and cost problems not readily solvable. What fraction does Las Vegas cover today? World annual energy consumption 2007 was 11099.3 million TOE. What is the obsession with footprint? The footprint of an energy system is almost totally irrelevant. The relevant characteristic is cost per delivered kwh. By that standard, solar in any of its current forms is a giant FAIL! Delivered kwh takes into account all associated costs of arranging things such that when you flip the switch, the lights come on. For wind, that means spinning reserve (less than 20% total electric production) or storage (greater than 20% penetration), for solar, that means inverters, grid capacity, etcetera. There is some room for solar in hot climes where peak load matches up with peak production, but that will be very very limited. Realistically, renewable buffs would be FAR better off pursuing small scale hydro and clearing local hurdles for large scale wind, those at least produce KWHs at a reasonable price. See again, Sargent & Lundys Engineering, report referenced above. pp ES-3 of executive summary. S&L states cost estimates used require no technology breakthroughs, simple normal detailed development of some subsystems and volume production. Sunlab estimates assume a couple of fairly do-able improvements in reciever efficiency and collector fluid temperatures. At those rates it can compete commercially unsubsidized head-on with coal and natural gas. Just needs to get those first few GW installed in order to get volume production and operation. Should be new administrations top priority. Wind can never get to these prices because it's too low a capacity factor, too difuse. Solar CSP also produces most reliably right at peak load periods. Why not kick CSP into high gear by rejecting the waste heat (85%) to an Atmospheric Vortex Engine and double the output with barely a 10% increase in overall investment. You have to reject the waste heat to an air-cooled condenser anyway in the desert. It seems like a "no-brainer" to me. The following are calculations for add-on to a fossil plant. The increase in efficiency for a CSP plant will be even more dramantic. I think the problem is that we don't know if coal cost less or more than CSP. It is currently priced less, but there are many externalities that are not priced in, and are currently paid for with the Income Tax. Until we attempt to price in the costs of coal (and other forms of energy), we will not know which costs less. My feeling is that wind, solar and nukes will look pretty good. Sure, footprint is irrelevant .. to you. You're not buying land, building roads, getting permits or variances. "..cost per delivered kwh. By that standard, solar in any of its current forms is a giant FAIL!" It's not at all a 'giant Fail'.. yes, it's more expensive at the moment, but not by all that much any more.. and while to be fair, you did say "Current", it was only in reference to available Solar technologies, it does at least point to where you aren't looking, which is one of several very likely tomorrows. These 'Delivered KWH' takes into consideration many things, but not all. What does a KWH cost when the coal quality gets 25% worse? When there's an NG interruption or peak, when SA says they'll have a new voluntary reduction in exports? Sun's still shining.. but the lights are out. Should we have built it? Small-scale hydro buffs probably don't tend to migrate to Death Valley or Arizona in very large numbers.. it's fine where it's fine.. but even if I had a nice stream in Eastern Georgia, I don't think I'd put all my eggs in that basket. I watched an Amory Lovins talk on building efficiency posted in yesterday's drumbeat comments. (ok, I'll go get it.. http://video.google.com/videoplay?docid=-6669123891673213585&ei=Fq1jSY7-... ) Hat-tip to OMGlikeWTF ..
..and Lovins reminds me that to design things like nature does (with compounding efficiencies and other benefits) it helps to make each element serve several functions. He shows several examples of the numerous savings and advantages in this approach. In the case of a desert/prairie CSP installation, I thought about this weekly washing, wondering if the washdown could be minimized by growing around it an appropriate type of grass or other vegetation for the region, which could help to support a range of native species that would otherwise be displaced. Ideally, the washing would be less frequent with less dust coming off the nearby ground(? ), but would additionally be part of an irrigation protocol for this groundcover and habitat as well. This is purely a spitball suggestion, but is intended to look outside the expectation that such an installation has to fit into the classic industrialist mold of creating an intensely single-purpose site, when going multipurpose can help both the technology itself, and also the social relationship to the facility, or instead maybe filling a second need (growing mushrooms, mesquite?). If this were developed with the added aspect of a 'desert park', then the pressure to pack the collectors into an overly tight footprint might also be loosened, since an environmentally benign or benevolent setup could take on the public desire to have as much of this protected habitat as possible..
Not knowing the desert ecosystem, I'm sorry that I can't fill in the blanks with better synergies, but of course these kinds of 'one hand washing the other' combinations are best served with people who are the most intimately aware of the needs of the area, and the challenges, needs of the technology. I don't look on the two as inevitably in conflict.. it only goes that way when we ignore one in our singleminded focus on the other.. It should be do-able provided fresh water is available for the washing. Perhaps more resource responsible would be brackish groundwater or piped-in seawater for washing, meaning not vegetation-friendly ??? Couldn't you use compressed air? You could compress it using the power generated by the plant at peak, and use it to clean the mirrors at night. Perhaps do-able, at least in part? No doubt all options are already considered though. I have serious doubts that all options are really being considered, even if the engineers involved are sympathetic to the issues. The perception is that these complex relationships will just add to the project cost, and more immediately, to the planning and proposal costs.. and as such, they too often get 86'd before they get their day in court. As far as brackish water is concerned, one of the systems used in greywater systems is a natural cleaning setup using a chain of ponds with well-selected wildlife/vegetation that handles stage upon stage of water treatment. I would suspect that there would be a strong disinclination to use unclean water or saline water on expensive reflectors, so the availability of a water-cleaning support system (that like some shading?) might be well-received. By all parties. This link is a business/state program.. but many desert homeowners have developed water reclamation ponds this way as well. ..This has led to the current activities of the Desert Research Unit (DRU), devoted to study of (1) constructed wetlands for wastewater and storm water treatment, (2) presence and fate of emerging contaminants in arid environments, (3) revegetation of disturbed areas such as Arizona farmlands that have been retired for water rights and (4) techniques for improving water conservation. I hesitated to discuss it because of adding complexity to an already controversial issue, but the Desertec proposal above includes in its design provision for doing sufficient reverse osmosis water desalination to provide 1st world level domestic water and irrigation water to entire Middle East and North Africa..... For Arizona would need some sort of access to large volumes of seawater. A pipeline or canal from the Baja / Gulf of California? Looks like it shouldn't cost too much to pump seawater in past Monument Bluff, from there it's pretty much downhill all the way to a lot of desert area. A bit of a storage pond inland would allow the pumping station to operate mostly with off-peak electricity. Perhaps de-salination plants are too expensive to operate only part time. ? What I like about the regenerative ponds is that you've got the output of one as the input of the other.. with a big pipeline and a rev. osmosis desal operation.. it's adding more and more inputs, but not taking advantage of the loops that can downscale some of these externalities. In the Lovins talk (really worth listening to.. linked above), he describes adding almost unthinkable levels of insulation, superwindows, air-cirulation and management, etc.. dollars, dollars, dollars, but then shows that all of these helped to Radically downsize and often eliminated the need for any Heating, Cooling or Ducting equipment, which then brought down the required machine-room space, allowed a 10 story bldg to then have 11 floors, for example.. the cost savings all of the sudden outstripped the outlay for these 'amenities'.. Probably sounds too 'organic', but designing with these Harmonies lets the energies work together.. (which is what harmony is, after all) instead of just amping up the input powers. I was trying to get an idea of the magnitude of the problem. A CSP using water cooling uses 800-1000 gallons of water per MWh. The most obvious way to conserve water is to use air cooling instead of water cooling. This isn't the usual method. The reason most nuclear power plants use a large quantity of cooling water is the temperatures they are limited to by the use of water in the Rankine, (steam), cycle. With a top temperature of maybe 300º C, (575º F), you need 25º C condensing temperature to get 34% efficiency. When operated with a Brayton Cycle at about 900º C, (1650º F), and 100º C at the bottom end you can get better than 50% efficiency. Air cooled heat exchangers can get down to 100º C, but not 25º. Glad to help. The same principles apply to super-light weighting vehicles, less mass means smaller engine, less suspension, smaller brakes so for every kg of body weight you save you actually save about 1/3 as much on top from making the rest of the car lighter (See Toyota's 1/x http://www.autoblog.com/2007/10/10/tokyo-2007-preview-toyota-1-x-pronoun... (less than 500kg). Start adding some major aerodynamic considerations as well as you can save more fuel. According to the RMI that improves vehicle efficiency about three times over, add a hybrid drive train and double the efficiency again, then and only then look at using some alternative fuels in the mix. That gallon of ethanol could move 10 vehicles 10 miles each rather than just one. Any ideas why RMI is a fan of hydrogen but dismissive of nuclear power? They claim hydrogen can be used more efficiently than natural gas as a transport fuel, but a small natural gas engine for cruising or recharging batteries in a vehicle would be far cheaper and simpler that fuel cell and hydrogen storage system. With regards to CSP, the process has a lot of synergy with potential terraforming deserts, hardy plants could be grown around the mirrors. Prickly pears can be used to make biogas which the plant could co-fire with natural gas in a solar assisted combined cycle, and the exports from the system could produce a digestate and clean water for agriculture. Another idea is the seawater green house, http://www.seawatergreenhouse.com/ using seawater to keep itself cool. I'm wondering if we will see a big cultural shift towards eating insects? A potential source of lots of proteins. Any ideas why RMI is a fan of hydrogen but dismissive of nuclear power? It appears to be the old "no nukes" shibboleth, and Lovins has been behind it for so long he can't change without destroying his credibility. He doesn't have the integrity of James Lovelock. Even the radically-reduced amounts of fuel needed to run hypercars will eventually go away, and Lovins has long been dishonest in failing to address the issue (and the consequent GHG emissions). I have heard him say peak oil is 'irrelevent' as there as so many other reasons to make the technological changes. As for nuclear power he says that efficiency, renewables and CHP can deliver capacity (Nega or Mega) and carbon savings quicker, cheaper and safer with less capital risk. I think the future will include a sizeable wedge of nuclear power, especially if electric transport grows as much as expected and improves the load factor of the grid. GW size baseload plants will always have a place on the grid, and any new fossil fuel plants could face fuel supply problems within their operational lifetime. Doesn't have the integrity? Or maybe he just doesn't agree with your conclusion? He states his case around what he calls the failed economics of Nuclear Energy pretty clearly. Calling it a matter of integrity says more about you than him. The claim that “we need all energy options” has no analytic basis and is clearly not true; nor can we afford all options. In practice, keeping nuclear power alive means diverting private and public investment from the cheaper market winners—cogeneration, renewables, and efficiency—to the costlier market loser. These are the same fuels that are depleting rapidly. Nuclear is quite competitive with coal, and even a small carbon tax will make it one of the runaway favorites (along with wind). Nuclear provides baseload, and with Gen IV technology is actually a complement to wind (providing high-temperature heat for CAES). You will not find RMI addressing these issues; they are Crimethink, literally outside the language they can use. Lovins is very good at his focus, which is looking for energy waste in the demand chain back towards supply, and he is weakest in any arguments involving raw supply types. I wish he would just drop any discussion of the supply aspect, since his views seem more driven by a desire for renewables than hard math. That doesn't change the accuracy of his demand observations, where his analysis are usually pretty good but sometimes hard to scale. Still, if every new house were Lovins-inspired, and every new building design, and every manufacturing plant, the US and world would be much more efficient. We're so used to hearing pronouncements from on high (from gov't or industry) that the notion that we all COULD save half of what we use rather than doubling the power we generate seems hard to internalize. '..more driven by a desire for renewables than hard math.' ?? or at least several, perhaps upwards of ten, kWh of electrical savings from more efficient use. The RMI claims above are self-refuting. NG turbines cost a lot more per kWh than nukes, especially when the cost to drill new gas is $8/mmBTU (even at 60% efficiency in a CCGT, that's about 4.5¢/kWh just for the fuel). "an infinite number of kWh from waste-heat cogeneration" is impossible on a finite planet (or even in a finite universe). Nuclear is one of the few sources of energy available to the USA which will not deplete significantly over the next century. The RMI prescription is for radically increased efficiency, which some folks here have been touting as the road to ruin; it certainly won't help when the source of energy is cut off. What efficiency does for you is let you convert to some more expensive but available (and expandable) source at a price you can afford. Those sources, in order of contribution to the US energy mix, are nuclear, wind and solar. "What efficiency does for you is let you convert to some more expensive but available (and expandable) source at a price you can afford. Those sources, in order of contribution to the US energy mix, are nuclear, wind and solar." Nicely put, but of these three, nuclear is by far the most expensive and dangerous. And we don't have lots of extra cash for expensive, dangerous approaches. Again, efficiency (including doing without wherever possible) is the cheapest and least dangerous and what needs to be our first, second....umpteenth top priority before we go off frantically building vast new power generating systems of any stripe. ... of these three, nuclear is by far the most expensive and dangerous. All the hazards of spent nuclear fuel are either theoretical or political. Spent LWR fuel is put in dry-cask storage at plant sites because political opposition has prevented opening of disposal sites or even shipment of the spent fuel (the goal of the anti-nukes was to shut down plants by filling their cooling pools, but the certification of dry casks circumvented that tactic). Political opposition has prevented e.g. pyroprocessing of spent fuel to separate transuranics from the waste stream. we don't have lots of extra cash for expensive, dangerous approaches. efficiency (including doing without wherever possible) is the cheapest and least dangerous and what needs to be our first, second....umpteenth top priority before we go off frantically building vast new power generating systems of any stripe. No matter how efficient you get, after you shut down the 50% of US generation from coal and the 20% from gas and add the demand transferred from petroleum as EVs take hold, we're going to need plenty of new something. Too little has been done with the solar pond concept. Solar ponds act as both the collector and the storage system. Depending on the depth of the pond very large amounts of energy can be stored at little additional cost. While not as efficient as a CSP system it is much less expensive and can use light coming through clouds. The problem is that it is low grade heat. That's the problem with so many storage systems. This is a major problem in any chemical plant or refinery; when your condensate gets down to a certain temperature there really isn't a whole lot more you can do with it. You preheat feeds, etc. but it is hard to get much usable work out of it. Theres as much waste heat in our systems as there is energy used at the end of the line. - avoiding the need for dispatchable backup plant. The article suggests each of these criteria would be hard to meet. CSP supporters claim it suits summer load following but even then there are alternatives such as passive cooling, heat pumps and smart metering of aircons. In Australia people are being told to change their roof colour to lighter shades. Of course if every sunny country had an extensive HVDC network then output routing might be easier. That kind of money is never going to be available. I think passive cooling, better insulation, Green or 'Prairie' roofs and other approaches are far preferable to just powering a bunch of A/C units, the business day will still likely see a raised level of power demand, which CSP will help to match. I don't see this insistence on minimum outputs and baseload power to be the right direction to apply pressure. Continuity of output is in the producer's best interest in the first place.. (As is being able to meet peak demands, for complementary reasons) so it's reasonable to expect them to make every effort to keep the power coming out.. But as a mentality, " perpetual baseload" strikes me as the kind of inflexibility borne out of growing up in a world all the power we could ever spend, but which leaves us paralyzed when it's not there. Point taken. Big baseload demanders such as the aluminium industry effectively scuttled Australia's cap-and-trade scheme. But have they even tried to adapt to a more variable grid? However God forbid I should be in hospital connected to a machine that goes 'beep'. I want that machine to be connected to a reliable power supply. You are perhaps confusing reliable power supply with intermittent power. The gas interruption in WA is a case of unreliable power, where a third of the grid was put out of action for several months, or the case in Japan where a nuclear plant was off-line for several months. Solar and wind are probably more reliable but intermittent, so need to have a short term back-up such as hydro or NG peaking available. Those back-ups can also be handy when a major coal or nuclear plant has a non-scheduled shut down. No power source is 100% reliable , thus hospitals have diesel back-up power. Its too early to expect Aluminium producers to adapt to a more variable grid, before any cap-and -trade scheme is in place, but in the WA power interruption last year, they did reduce electricity used for alumina production. And Alan FBE and others remind us that we do have stable sources as well. Locate the Aluminum smelters in Niagara, near the falls.. they're suited for each other. Whereas there might be a distinct advantage to devising a mfg process that actually can take really good advantage of intermittent power, and can couple well into regions that are heavily reliant on cyclic sources like Tide or Sun. Cheesy example, but Bakeries who would schedule 'oven runs' with the tide charts to take advantage of the best electric rates.. ?? Four Big Batches a day! I've wondered how far smelters can power down. They do use molten salt electrolytes, and I bet letting one freezeup would cause some serious damage. But the power level to keep warm, versus for optimal production might be very different? But of course most industrial processes with a high capital cost, want to operate 24/7 -or very close to 24/7 because they have a constant cost per day of capital that they don't want to waste. So clearly they have to be given some sort of monetary incentive for adapting to variable power. I've also heard that Glass production likes (!!) to keep the heat on at all times.. and so this would be another plant to try to locate near a big Hydro location, were there no way to run this kind of system without steady baseload power. Were we in the situation of having to start choosing, I suppose price would do some of the selecting of who can get the luxury power, and we might also see some policy decisions that gave assistance to absolutely necessary industries, but that didn't have the clout to stay in the game through sales alone. I'm reminded of a cooking system in poor places (or very practical ones) where you take your boiling pot of 'Stew' off the fire and into a heavily insulated container, sometimes a strawlined box or larger pot, to continue cooking on the stored heat, as you save your firewood. It makes me wonder which Heat driven industrial processes could superinsulate in order to hold onto as much energy as they could during blackouts or brownouts.. or simply to shut off the inputs when the energy costs are above what they want to pay. Many industries that cannot interrupt operations have back-up diesel/NG power, so save on power costs by having non-firm supply and using diesel/NG for the rate occasions that grid power is off. This only becomes expensive if power is off for weeks or months due to a major break-down, then the decision has to be to close a production line. This adds to grid stability. Hydro is too valuable to be used as base-load, as it is much better used for rotating reserve and rapid peak response. These issues have been thought out in great detail and I would be surprised if there were any "unthinkables". This option seems to be unthinkable - consumers should pay more for energy intensive products. Example a 20c refundable deposit on soft drink cans. Too tacky? Then hold your canteen to a soda dispensing machine. For 'soda', we're actually making Kombucha, a fermented Chinese/Russian? iced tea.. supposedly very healthy and with no caffiene or sugar after the fermenting is through. Slightly carbonated and tart. Big glass jug, and glass juice and jelly jars, which is why I mentioned glass production. ..Oh, but your main point is well taken. It seems we will be starting to see the real price of our goods one of these days. I'm sure we'll all be shocked at some taken-for-granted item or other, as it balloons in price, or just disappears from the shelves. Whenever I get super-doomerish, I look at all of the waste in the system, and find a little relief. Waste is everywhere, and is so profligate, that IF it were removed in an orderly fashion, we should all be able to live well within resource limits for a long time (at least until my natural lifespan is reached). I doubt that we will manage it well, though. As a lifelong Trashpicker, it's hard for me to get too doomerish, even if I agree that so much is vulnerable to falling apart out there.. just looking at a trashed clock-radio or a boombox (Transistors, Caps, LEDS! ), glass containers, cracked mirrors, plastic buckets, corrugated cardboard, aluminum baking pans, a 2x4 with a lot of 20penny nails in it.. These are valuable items, and we've got backlots and landfills and basements brimming with this stuff. You won't be needing this no more. Shouldn't this calculation be done with the average daylight hours or usable sunlight hours if it is assumed that no energy storage is being used? This would double or triple the wattage allowing for the use of other factors to get closer to the stated 280MW capacity of the plant. For example, using 12h usable sunlight per day and reducing the efficiency of conversion to 10% would yield a capacity of 274MW. The lower the usable sunlight hours gets, the more conservative the 280MW looks. When sizing PV arrays, one has to be very careful about this kind of thing or your yield will be considerably different from what you expected. So when he says its a 280MW plant, it is producing three times as much power for eight hours during the day and none at night. Since he specifies this is for a plant near Phoenix, that's ok. This thought experiment just tells us if the CSP can produce enough energy. It doesn't say anything about load following. Unless we add storage. That has to be for a tracking system, at a good site. The surface area of a sphere is 4 times the area of the same sized circle, so with a totally transparent atmosphere you get 250watts (1000watts time .25) on average. At the equator you do a bit better, and a high latitudes you get less. A tracker with no atmospheric loses would have a load factor of .5 (sun is up half the time averaged over a year), with no variation by lattitude. So these must be tracker type numbers. Reading the article, this number is based on flat plates, 1-axis tracking, tilt = latitude at Phoenix. To my knowledge all CSPs must be tracked, or they won't focus right. The 15% conversion ratio is the real kicker in all of this. There are thousands of companies and universities doing research to increase the conversion efficiencies above the 15-18% currently available. ScienceDaily.com has reported on conversion ratios approaching 40%. What I don't see is an organized national effort to combine all these new technologies into market ready products. Yes, you'll get 40% using exotic materials like gallium, which we don't even know if we have enough of. The problem isn't producing one solar panel at 40% efficiency, I have no doubt we can do that. The problem is producing a million solar panels at 40% efficiency. That is what several outfits are trying to do. But, 40% efficient cells are currently for concentrated PV use only. This is for two reasons. The most obvious is cost, which is amortized by using reflectors and/or lenses to greatly concentrate the sunlight. The less obvious reason, is that these ultra high efficiency multijunction cells only deliver high efficiency under very strong illumination. Of course any such solutions require two axis tracking, and won't work at all through clouds. Meanwhile for the various sorts of flat panel technologies, minor improvements in efficiency are being made. It used to be that 15% was high (and probably too expensive), now its probably more like 18%. Can you point me to some links on transfer functions and dynamic ranges of various PV technolgies? Google seems to have failed me. The Stirling dishes are made with a low iron glass with a silver backing that make them highly reflective —focusing as much as 94 percent of the incident sunlight to the engine package, where prior efforts reflected about 91 percent. First time poster here, been reading for about 1-2 years now. I just finished reading Overshoot by Catton and he seems concerned by potential unintended consequences by diverting a relatively small amount of solar power. I can't recall seeing any comments here on that subject, so thought I'd raise it to see if any strong opinions surface. My initial thought is that the "redirection" of solar energy will (1) be very small on a global basis and (2) will result in some (most?) of that heat ultimately being released into atmosphere anyway (a "catch and release" program?). I'd appreciate any comments on potential negative effects of high degree of solar energy capture. Catton must really love asphalt. For better or worse, we divert solar power anyways. See heat island effect. Personally, I see it as a non issue. We are already appropriating a large portion of the solar energy that falls via agriculture and fisheries. Some were talking a little while ago about the albedo effects of solar PV, but I just don't see how that could be a problem. We have already changed albedo more by urbanization. Releasing millions of years of stored carbon dwarfs any of these effects, I would think. While the amount may be small in the big picture, urban heat islands are well-known zones of higher local temperatures, caused by the absorption of greater a greater fraction of short-wave radiation from the sun as compared to the surrounding countryside. This is combined with heat discharged by home heating, urban power plants and moving vehicles to give the total effect. In urban-heat-islands, people have to turn up their air-conditioning more than those living in the countryside, causing more carbon emissions, which is the real problem. PV panels on roofs tend to increase the heat-island effect, while "white roofs" tend to decrease it. White roofs reflect short-range radiation from the sun, which is NOT absorbed by CO2 on the way out. It would be interesting to try and calculate if the net forcing by adding incremental solar panels to roofs in a city, which could otherwise install "white roofs" more cheaply, is positive due to increased local heat discharge (decreased albedo), or negative, due to reduction of the CO2 load from a power plant outside the city limits. Several Atmospheric Vortex Engines in the center of an urban area could take advatage of this 5-10 F temperature boost (urban heat-island effect) to increase the efficiency of the process, while, at the same time it would draw cooler air into the outskirts of the zone of interest, lowering A/C costs. Doesn't the heat island help during the winter as much as it hurts during the summer? Even 5F is more than we see in my small city though. Maybe more like 2F. No, unfortunately it doesn't, at least in far northern climes. Here in Minnesota, all of those dark roofs that make it hotter in summer are covered in white snow to reflect what winter sunlight we get. IMO, if we only make one change wrt energy policy, it should be to mandate white (or light colored) roofs. While in Minnesota, those rooftops first job should be using that sunlight to heat the building and the domestic water and cook the food, anchored against geothermal. Shunting off all that solar hitting every rooftop is simply throwing away free energy. I think a great portion of all our roofing should be glass.. another good use of silica. Systems beneath would either capture, retain or dispel heat, as needed. Long lived, non-toxic, recyclable. The average annual temperature in Santa Ana has increased by 7.5 degrees in less than a century, a spike largely attributed to urbanization which has seen the city’s population climb from less than 15,000 to more than 350,000. The temperature has gone from a low of 59.7 degrees in 1920 to 67.2 in 1997, with yearly temperatures near the all-time high as recently as 2006. 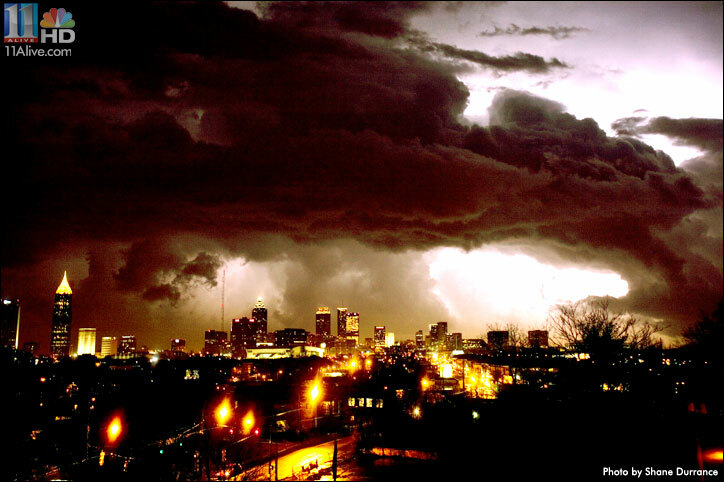 I suspect that the tornado that struck downtown Atlanta in the summer of 2007 was intensified by the UHE. It was on a Friday evening after a week of traffic/high temps, when the "net effect" would be the highest. My Bad. It was during March Madness of this year. Can anyone tell me how I go about posting a dramatic JPEG image that I found of the tornado? As a species we already redirect a lot of solar toward both intended and unintended ends. We use a great deal in agriculture, silviculture and fisheries - as has been pointed out. We also have large areas of urban heat islands and roadways. These have all resulted in biosphere degradation, either directly or indirectly. I think it is highly likely that large-scale solar farms will also have direct and indirect negative effects upon our biosphere. Direct negative effects would possibly be due to the use of the land driving out natural ecosystems - indirect negative effects would likely be related to the enabling of the BAU paradigm involved with scaling up such a scheme as required to match our energy needs as well as redirecting solar power from the biochemical and biophysical sytems currently making use of it. I don't know if anyone has studied at what point the redirection of solar energy from the biosphere will start to cause problems. I think we might have a situation similar to that with fossil fuels - one ICE/cooking fire/coal driven power plant has negligible effect but once we scale up - Yikes! My opinion - just giving language to the itchy feeling I get between my shoulder blades when we start discussing "scaling up"
I am glad to see someone else raising this question. At first blush, the energy converted and transported seems trivial compared to total insolation. It can also make the future look cornucopian, whether intended or not, which has its own dangers. When you consider that our total change in net insolation due to ACC is on the order of (only?) 2% and we are near or past a tipping point, just what is a trivial amount? How many times have we assumed that a subsystem can absorb abuse on our part, only to find later that we have royally screwed it up? I get that same uneasy feeling and I have great respect for the law of unintended consequences. I expect we will have more than a few surprises along the way and we are more likely to see them with massive solar/wind farms. Across America are millions of outdoor swimming pools, many (especially further north) heated. One might propose that moving away from the custom of painting pools white, and replacing with a non-reflective color such as royal to deep blue, would greatly reduce the heating effort. Indeed, I once lived in Michigan in an apartment complex that had a swimming pool that had been painted dark, and at one point residents threw blocks of ice in it to get the temperature down. Would someone care to try a calculation on this? Incidentally, on the stored concentrating solar, burying the storage is an insulation feature, so perhaps the storage will not need to add to the required footprint. I live in an apartment that has 720 sqr feet and my electric bill averages less than $30 per month or about 250 kW hrs per month or 0.30 kW average over the day (largely from 6 am to 10pm). The CSP plant described here puts out 1370 mW (1,370,000,000 Watts), thus being able to supply power for 4.56 million people that use power like I do. This would be for residences only, as at work I do use more than 300 watts average (maybe 1000 to 1500 watts for 8 hours or 8 to 12 kW hrs). The fact is that if people lead a non energy intensive lifestyle the nations requirement for electric power could be greatly reduced. I think electric power should be taxed for high kW users. Thus those that want to use more will bear the cost of new power plants and those that conserve get an extra bonus of lower rates. Clearly there are a lot of roofs that aren't doing much towards gathering useful solar energy. And I agree that we should be making use of some of those spaces with local power/energy generation. Like at my house! But I tried finding a solar heating system that would tie into my hot water heating system and it seemed 1) very difficult if not impossible to integrate with my existing system and 2) I couldn't even afford the basic setup. I would love to have a solar heating system as a hedge against bad things happening with gas and electricity, but all I can afford is a woodstove. Luckily there still are a lot of trees around here, for now. Meanwhile, all this talk about paving over 1/15th of Arizona for Big Industrial Power Production makes me think that the people suggesting this either don't live there or they've never been hiking in the desert. Having lived in Arizona for awhile some time ago, I kind of liked the Sonoran desert the way it is. It's beautiful most of the time. I don't think it would be a good idea to compact all the soil there, tear down all the saguaros, and put in concrete pylons all over the place just so people in Michigan can turn on their air conditioners. If nothing else, it's a plan with bad feng shui. Now if you want to talk instead about turning Phoenix into a solar farm, maybe I could get behind that. It seems like solar and wind power are at their roots, fundamentally local. Maybe we should be too?